Katsushika Hokusai (1760–1849), Under the wave off Kanagawa (The Great Wave) from Thirty-six views of Mt Fuji. Colour woodblock, 1831. Acquired with the assistance of the Art Fund. On display in 'Hokusai: beyond the Great Wave' from 25 May – 13 August. Hokusai produced works of astonishing quality right up until his death at the age of 90 and this exhibition will be the first in the UK to focus on Hokusai’s later years, when he produced some of his most famous masterpieces. 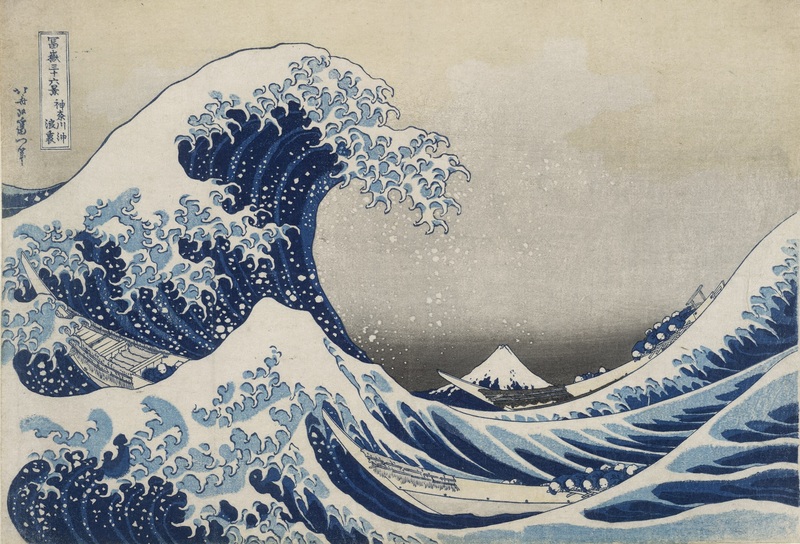 Starting with the iconic print ‘The Great Wave’, which Hokusai created when he was 70, the exhibition will include outstanding examples of the artist’s work demonstrating his creative breadth and depth during this prolific period. Katsushika Hokusai (1760–1849), Weeping cherry and bullfinch. Colour woodblock, c. 1834. British Museum. On display from 7 July – 13 August. Hokusai’s later career will be explored thematically as well as chronologically in the exhibition. The subject matter of the works on show will be extraordinarily varied – from dramatic landscapes to intimate domestic scenes and exquisite birds and flowers to supernatural and mythological creatures. The exhibition will also explore Hokusai’s personal beliefs, giving a fascinating insight into the artist’s spiritual and artistic quest in his later years. Katsushika Hokusai (1760–1849), Mirabilis jalapa and grosbeak. Colour woodblock, c.1834. British Museum. On display from 7 July – 13 August. The exhibition will bring together works from the British Museum’s superb collection of Japanese art with significant loans from Japan, Europe and the USA, making this an incredible opportunity to see these extraordinary works together. Katsushika Hokusai (1760–1849), Amida waterfall, deep beyond the Kiso highway. Colour woodblock, 1833. The Tōyō Bunko, Tokyo. On display from 7 July – 13 August. There will be a rotation of about half the artworks during the exhibition run for conservation reasons. Due to their light sensitivity, some works can only be displayed for a limited amount of time, to preserve the vivid colours. Each rotation will tell the same story, but you will be able to see a selection of different works in each half. The exhibition will be temporary closed between 3 and 6 July for this rotation.